Voting has started for America’s Favorite Crossing Guard. Safe Kids Catawba County has nominated Officer Evaleene Fowler from South Newton Elementary. A twenty seven year veteran of the Newton NC Police Dept, Officer Evaleene Fowler has been a crossing guard for all but a few weeks of those years. 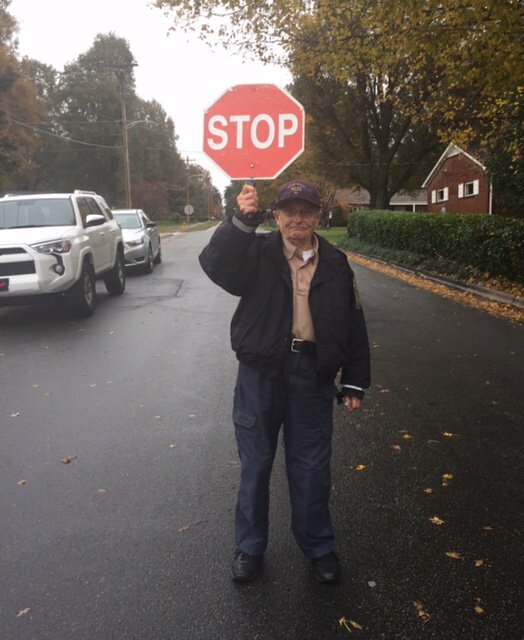 Although the pedestrian population at South Newton Elementary School is small, Officer Fowler is at her post morning and afternoon, rain or shine with the positive attitude parents and students have grown to love. Go to https//www.safekids.org.crossing guard and search for Ms. Fowler in the search box. Go trough a series of box clicks to prove you are not a robot and provide a valid email address. Once you click on the email link the vote is counted. South Newton stands to win $10,000 if first, $7,500 if second and $3,000 if they come in third. The Newton Police Department is proud to be recognized by our corporate partner Target for dedication to the community. Target is a proud supporter of Target @ BLUE which provides support and funding for law enforcement programs and initiatives that support the community. Many thanks to Old St Paul's Lutheran Church for providing lunch and a copy of "The Nobility of Policing" to our officers. Our Police Department feels so fortunate to have so much support from our commuinity! Once again the Newton Police Department has partnered with South Newton Elementary to participate in Club Day! Once a month officers facilitate a chess club and forensics club for interested students. tablets - should have up-to-date software including security software, operating systems, programs and apps. Make Sure the Site is Legitimate: This includes a closed padlock on your web browser’s address bar or a URL address that begins with shttp or https. This indicates that the purchase is encrypted or secured. For new sites, check online reviews. The North Carolina Department of Health and Human Services would like to highten awareness and educate the public about prevention and control. Provided is a link to the NC DHHS website with valuable information concerning rabies and other communicable diseases. We are very honored and proud to have the Good News! coming from Newton. Please follow the link provided for a story by Kristen Hampton from WBTV about our very own Eveleene Fowler and Ken Campbell..